I spent last week traipsing around the Sydney Biennale – an exhibition that seems to be growing larger every year. The popular Cockatoo Island is used as a site for the 3rd event running, as is Pier 2/3, the Museum of Contemporary Art (MCA), the Art Gallery of New South Wales (AGNSW), and a new addition: Carriageworks. Unfortunately, there is nothing in the botanic gardens, which is disappointing because many of my favourite works from the last biennales were sited there. The artworks on Cockatoo Island this year are, on the whole, far more in dialogue with the site than previous years. We’re so used to viewing art against ‘neutral’ white walls that the constructed environment of the Modern museum has almost become invisible. Comparatively, when art is placed in complex semiotic sites where the surrounding environment is very obvious and at risk of overwhelming the art, it’s important that artists and curators take this into account. Four years ago, I commented on the Biennale’s promotion of ‘more than 30 site-specific’ artworks supposedly on Cockatoo Island. As a buzzword, site-specific art makes for good press releases, however punters are confused when the works don’t actually relate to the site. This year’s Cockatoo Island artworks include some site-specific artworks, but far more that are suitably installed in dialogue with the site without being strictly site-specific. For instance, Ricardo Lanzarini’s drawings in a utilitarian-looking room on the top of the island are clustered near the pipes, doorways and other existing features (The artist also has a series of intricately drawn books made from cigarette papers displayed at the AGNSW). In keeping with my obsession with artworks that construct the lives of fictional people within exhibition spaces, I appreciate Iris Haussler’s He Dreamed Overtime, sited in a cracked sandstone house on the top island. However, when I challenge the invigilators on the story of the mysterious island caretaker, it is obvious they needed a bit more lying practice. 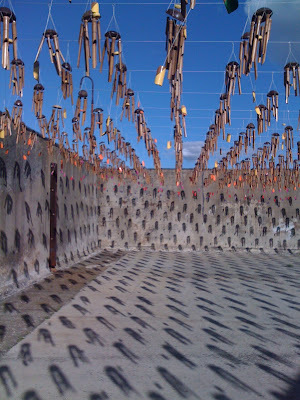 I also enjoy Nicholas Hlobo’s kelp-like installation, Ingubo Yesizwe in the Docks Precinct, where it’s initially unclear whether the mound of sewn black rubber, slumped on a boat ramp, is an artwork. There’s no fancy lighting or plinths here. Peter Robinson’s epic mound of carved polystyrene chains, which sit on, around, and within the rusty machinery in the Industrial Precinct, also relates nicely to the site, the (for now) white plastic contrasting with the darkened waste. Once I get over my initial ‘yeah, so, you can carve a chain, so what?’ (yes, I’m petty), it’s clear that in its scale and material, the installation is very successful. Nearby are Philip Beesley’s Avatar-like hanging objects, Hylozoic Series, which react to the viewers’ touch and movement. The ‘floaty’ artwork by Erin Manning, on the other hand, looks like something unfortunate washed up from Byron Bay, where scraps of hanging fabric and tulle surround a project table set up with thread and needles. The work on the warehouse floor below – Li Hongbo’s Ocean of Flowers - is more considered. The clusters of colourful accordion paper sculptures form a cartoon-like landscape though which viewers are allowed to walk. Later, we are shown the shapes that form the basis of these happy looking objects: guns and bullets. To be honest, I’m disappointed that the work can’t just be about the objects, that it had to be made out of war-associated objects. Like Pien and Tagaq’s artwork, the installation is made more complex than it needs to be. As with the 2008 biennale, the iconic island tunnels are used for site-specific artworks. Clustered around the bend in the Dog-Leg tunnel, Daan Roosegaarde’s light poles interact with the viewers’ movement. Jonathan Jones’ ubiquitous geometrically arranged fluorescent lights are also triggered by our passage through the shorter Tunnel 1 (his other artwork is pictured left). Jon Pylypchuk’s Esky miner creatures digging away at the northern end of the Dog-Leg are a humorous addition to the cave-like annex. Near the entrance to the tunnel is part of Fujiko Nakaya’s moody fog sculpture, which follows a similar work by the artist exhibited in the 1976 Sydney Biennale. (Now for some trivia:) The 1976 work was renamed and installed site-specifically in the sculpture garden at the National Gallery of Australia in Canberra – a place that, unlike Cockatoo Island, probably doesn’t need any more fog. As I wrote earlier, the Biennale includes a substantial number of works, and while the island’s scale to an extent relieves the perception of overcrowding, the MCA is not so lucky. Crowding aside, the MCA’s exhibition is pretty disappointing. The comparison between the excellent exhibition of the museum’s acquisitions on level 2, and the underwhelming and congested biennale installation on 1 and 3, is pretty indicative. The Biennale exhibition at the AGNSW is separately titled In Finite Blue Planet, complying with the art world’s current love of separ at ing wo rds (and its rarely for obvious reasons). Evidently, the exhibition’s focus is on environmental concerns, however, there seems to be far stronger threads relating to craft, labour and work. Gao Rong’s trompe l'oeil life-sized domestic interior diorama is painstakingly hand embroidered, Hassan Sharif’s installation consists colourful piles (each a separate artwork) of obsessively wrapped found objects, and Nipan Oranniwesna’s fragile City of Ghost is an intricate map formed with scented baby powder (I witness a child write his name in it on the biennale’s second day. Good luck, invigilators). Then there are the delicate cut-outs: Yuken Teuya’s Notice-Forest: Six Jewels carved out of branded paper shopping bags, and Jorge’s Macchi’s altered world map. The star of the biennale is Cockatoo Island, which has been the case for the last three events. 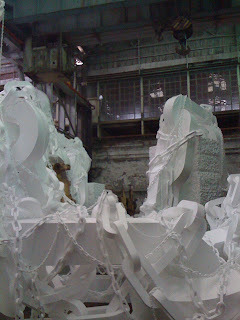 Then again, perhaps it’s as much to do with the spectacular machinery and nostalgic industrial fetish as the art itself. ...and maybe the Island Bar. Beezley gets a big mention on New Scientist, that's two Cockatoo Is piece I read this morning. Lucy Hawthorne is a Hobart-based writer and artist. 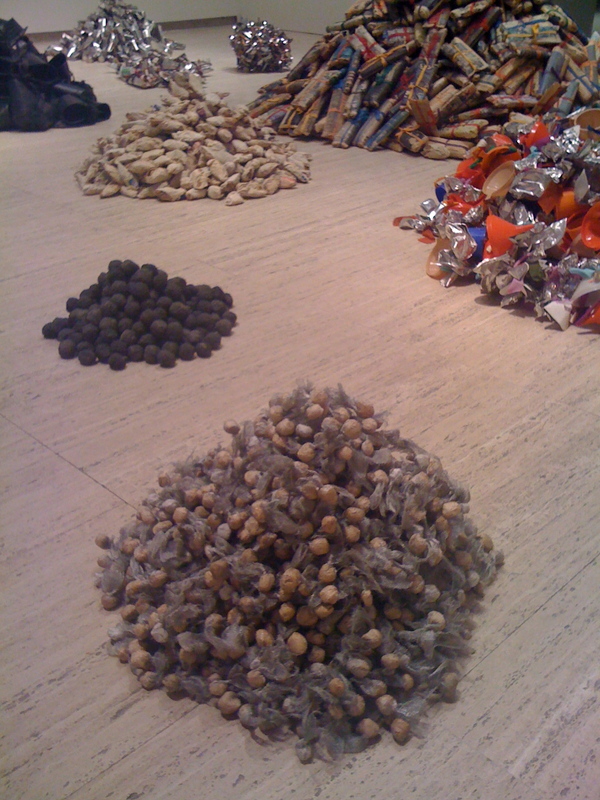 She has a particular affection for pet rocks and topiary, and wrote her PhD thesis on site-specific art in Australia's public museums. hobART by Lucy Hawthorne is licensed under a Creative Commons Attribution-Noncommercial-No Derivative Works 2.5 Australia License.